Hyundai is working on some kind of sports car project, as the company appears to have confirmed at CES. The exact nature of the car isn’t clear, but it really should be a supercar. The stars are aligned. The time is right. When asked by Drive about the progress of the sports car project, Donkerwolke confirmed he plans to review the latest design elements of the vehicle in Korea within the next fortnight. “I can’t tell you more about it, but definitely we are doing that,” said Hyundai’s design boss. But when quizzed further, the high-ranking Korean confirmed “we are very much interested in that” and admitted the car will be a two-seater and feature a plug-in hybrid powertrain. Note that Drive says that Chul admitted the car will be a two-seater but gives no quote to back that up. Odd. And the site only claims unnamed “sources with knowledge of the project” confirm that Hyundai has been benchmarking cars like the Porsche 911 Turbo and Lamborghini Huracan back at its South Korea development center. In any case, nothing in this Aussie news report confirms a supercar project. That’s a bummer. Hyundai really should go supercar. Now, Hyundai’s most recent sporty car concept was the RN30 from late 2016. It’s a 374 horsepower ultra-modified version of the i30 hatchback. It has gullwing doors. It is slammed to the ground. It’s silly and wonderful and shows off the company’s budding N-division of in-house performance models. Let’s not forget that the i20 is a serious contender in the World Rally Championship these days. Hyundai can make a fast car if it wants to. 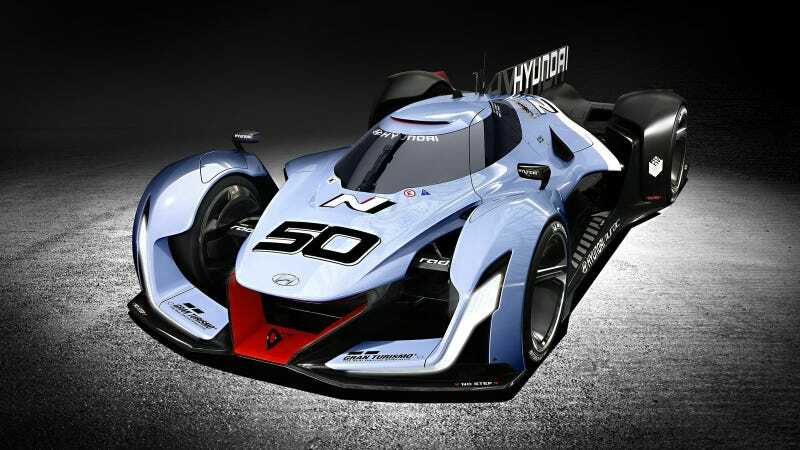 But before the RN30 was the company’s Vision Gran Turismo project, debuting in 2015 as an imagined hydrogen fuel cell prototype race car for the year 2025. It looked good. It looked quite good. Everyone loved that VGT racer, and on the back of the company’s years of playing around with sporty cars like the Veloster and the Genesis Coupe, to say nothing of all of those different Scoupes and Tiburons, it’s high time for something to take on the big names of the high-performance market. Honda took on Ferrari years ago with the NSX. Toyota took on Jaguar and Porsche decades earlier with the 2000GT. I see no reason why the world isn’t ready for a Hyundai with more tech whatever else the establishment has to offer.